Jeff: You wanna go first? Julie: [Laughs] I suppose...Well, I grew up in Eau Claire, Wisconsin. I was raised in a Pentecostal Church, like Jeff. I went to a Christian school. We grew up in a small town, pretty sheltered. We weren’t allowed to do much--couldn’t go to the movies or go roller skating because of the worldly music. We couldn’t go to any kind of sports events. Our church life was restrictive and religious when it came to extracurricular activities. It was all I really knew, because I went to a Christian school and church camps. I was surrounded by that bubble. As a child, I had a special walk with God—and that relationship wasn't connected to any rules but just to a tender love for God. Besides, I wasn’t really the type of kid that questioned the do's and don'ts. I was a pretty easy kid. Julie: I have two older brothers, my older Robert and Bradford, who’s the middle child. I was really close to my brother Brad, 18 months apart. He was a pretty strong influence in my life. He always kind of looked out for me and was kind of there. Our family is pretty close. I give that to my mom, who kept us pretty balanced and close. I feel like I had a great mother who balanced things out. I felt like she had a good foundation and base to our home life, even though our church and school required so much. I feel like it was pretty normal in the home. The next night I was sleeping and I woke up, and there was another angel there. I remember it being like a child angel, a small angel. I remember it being bright. I just remember being so at peace and it spoke to me. And I remember thinking, “I’m going to remember what he’s saying to me. I’m going to wake up and write it down and remember.” And then I woke up that next morning and totally couldn’t remember what that angel said to me. It was something that God gave me and didn’t want me to remember, but at that moment it was a beautiful thing. I felt that was a special moment for me. Does another special God moment come to mind? Julie: And when I received the gift of Holy Ghost, I was 10. I remember praying and praying. I just wanted his Spirit so bad. I remember praying, “God when I come back from church, I really want the Holy Ghost. Please give it to me.” I remember going to church that night and feeling God all over me through the whole service. I just knew He had touched me and wanted me to have it. I went forward after the sermon and received the Holy Ghost, and I was so excited. I just felt like I was special to God. I would never go to sleep without praying. God placed other kids in my heart to help them and pray for them. I remember every Sunday I would pray for my friends. I felt like God put that on me when I was young. Also, through my parents divorce and needing that Father figure in my life, God had kind of touched me as a child and said I’m here for you. Little moments like that, when most of my friends were doing other things, I really desired a close relationship with God. How about you, Jeff? How did you grow up? Jeff: My dad was a pastor. I was born in Eureka, California. Couple of years later we moved to Stockton, he became a co-pastor in the church there. Then about a year or so after that, my grandfather who was the pastor of the church and my dad went deer hunting in Humboldt county, my grandfather was killed in a tragic accident. That marked a shift in our family. My dad, shortly after that accident, resigned from ministry. We then moved to Idaho when I was 5 years old. We were there for 2 years, after which, we moved back to Stockton. Several years later when I was about 13, my mother and father divorced. As it relates to my own personal walk with God. I can’t really say I ever saw any angels or visions, or even sensed that God was going to use my life. I followed all the rules. I did what I was told to do. It was my world, very much sectarian. We lived in a world that was very much separated from our city. I didn’t know anything else. I would certainly say my mother was largely instrumental in my spiritual development. 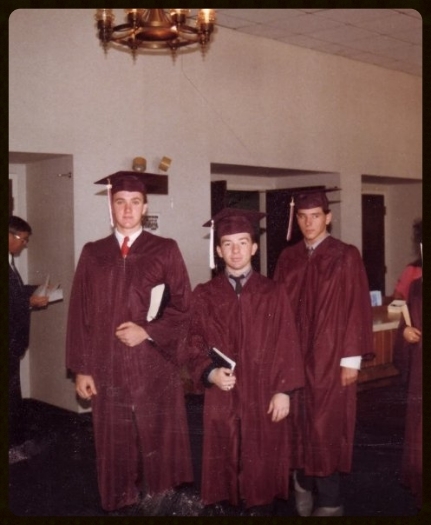 We prayed every night, and because we didn’t have a television we would listen to preaching tapes, have morning prayer, it was very much a devotional context my sister and me grew up in. When my mother and father divorced I was going into 7th grade and that summer we moved to Indianapolis, Indiana. We lived there for two years, my sister and my mom, and I. My mom felt safe there. Her sister and brother-in-law were pastoring a church there. During the summers we would come to California to be with my dad. Like Julie was saying, my mother and father were very involved in our lives. My sister and I never experienced or felt that my dad was divorcing us; only that they loved us deeply. I’m very appreciative of that. Going into my high school years, my mother and father got back together and we moved back to Stockton. During my high school years, involved in the church and very much involved attending all the events. "I was notorious for tormenting our babysitters"
Julie described herself as an easy-going child. I’m curious how you would describe yourself while growing up? Jeff: Ornery. Melancholy. Parts of me, very melancholy. It’s a work of grace that I have the personality and joy and passion. I was more melancholy and very reserved. I was also very ornery and very much a prankster. I pulled endless pranks on my sister. Many of them are legendary. Our extended family talks about them often. We had a couple babysitters. When I was in 4-6th grade, I was notorious for tormenting our babysitters. We had a swimming pool and they would go swimming. I would take a belt and chase them around and slap their fingers when they would grab to the edge of the pool. So they’d be stuck in the middle of the pool swimming around. There’s a whole list of things... We had a farm for several of those years. We raised horses. We had a stallion and a couple mares and cattle. A couple of times, when my sister was out on a horse, I would shoot the BB gun at the horse in the flank and get the horse to buck. Jeff: I would say we’re close. As you get older, you tend to get closer to your siblings. I’d say we are close. My sister is gregarious, outgoing, super-friendly and charismatic. I’m probably the opposite of that. Julie: Kim’s the type of person that never meets a stranger. Julie: So we would go to these Christian youth camps in the summer. And one summer there was a recruiter for Christian Life College who signed my brother up to go to the College in Stockton. Eventually I decided to go to join Brad. Jeff: Christian Life College was the college in Stockton where I was at. Julie: His grandfather started the college. Your grandfather started it. Jeff, did you always know that you were going to go to the college that your grandfather started? Jeff: No, that wasn’t my intention. My mother wanted me to go there, but that was not my dream. Jeff: I graduated a year early from high school. I really wanted to pursue an education in law. I wanted to be an attorney. I was fascinated with the whole courtroom scene. Practicing court law, criminal law. Even to this day, I can follow cases online or watch TV shows with court dramas in it. What changed for you then? Jeff: That summer that I graduated from high school, my mother kept pushing for me to go to that college that her father had started. She kept saying she felt like that God was calling me to be a pastor. My father didn’t care where I went only that I did reached my potential in life. He pushed for good grades, ambitiousness and being goal-oriented and wanted me to continue my education. I pretty much felt like I was home free. I’m giving Him one night. I'll tell my mom and that will be that. The next morning I woke up to headed out, running late, to the first teaching session. There was nobody in the parking lot between the dorm and auditorium but one person, an elderly lady, the camp cook. I didn’t even realize she was the camp cook. It was a large camp. 700-800 people. She was standing there and she was like, “Young man, I need to talk with you.” I was like, “Yeah?” She told me she had a vision. And I knew that was the end [laughs]. Jeff: I’ve told the story a lot but never mentioned this part of it—when I was in that year of high school, I was pushing the envelope, wearing things that were outlandish the movement was very conservative and I was moving against the grain. I had bright red or green pants on—this was in the 80’s. I had a shirt, the back of it came down to my knees. I’m setting that up to say, I did not fit the look of a young man wanting to be groomed into ministry. I was dressed that morning crazy and my reputation was a bit wild. There was nothing in my demeanor or dress that indicated that God was calling me and I was responding to that call. At that point I was resigned to going to school and being a pastor. I would say that the first two years I went begrudgingly, I was disinterested, I refused to make deep friendships. I would shower and hop in my jeep without the roof on and get there with my hair a mess. I wore a long trench coat. I was like, “Alright, I told you I’d come. Here I am." Then it wasn't until the summer before my junior year, God really grabbed a hold of my heart. I would say that was the place where God found me, where I allowed Him to have all of my heart. It took awhile. By that time, I was 19, going on 20. To backtrack on the vision. How did you interpret the vision? The way you said it, it sounds like you were getting sentenced. Jeff: Most of my family are pastors and involved in full-time ministry. I didn’t want that. There might have been some residue of my father’s experience with ministry that was on my heart. That could be something unconsciously working through. I was not elated. I was not excited. There’s an interesting story in the Old Testament. When the Ark of the Covenant had be taken and placed in the camp of the Philistines. They all breakout with a severe case of hemorrhoids. The entire camp. They narrow it down to it’s because the Ark of the Covenant. They were like, “Well, let’s get rid of it.” Nobody wanted to touch it or go near it. So they stick it on a cart and put two heifers that had just given birth to calves. They stuck the calves in a gated area and they carted up these two heifers with the Ark of the Covenant on it. And they said, “If the God of this Ark does not want to be with us, then these heifers will do something against their very nature. They will leave the calves they just gave birth to and will walk away from them and walk where the greater power is leading them." The story is that the heifers continued down a path with their calves crying out after them. The biblical text says it like this, the cows walked down the road, "lowing" as they went, like they were looking back over their shoulder lowing for their calves but a greater force was pulling that cart. That was a picture of where I was at in my life. I was lowing as I went. That didn’t shift for another two years. Did people know who you were there? That you grandfather started the college? Jeff: Yes, for the most part. Julie: But I didn’t know who he was. Jeff: She didn’t come to the college until after I graduated. Julie: He was a youth pastor at that point. Jeff: By the time I met her, I was the youth pastor at the church. Julie: I would’ve walked right past [laughs], not knowing who he was. Can you share with us that shift? Jeff: It occurred to me if I was going to do this, it would be miserable to not do it with everything in me. And I was miserable. Half-in and half-out, living passionless, having no vigor. It was killing me. The Spirit really grabbed my heart and said, “I want all of you. I want everything.” I remember committing in a time of prayer: “I will give you everything.” There was part of me saying it in a vindictive way. Up to that point my grades had suffered, from that point on it was 4.0. Everything was changing. I think a catalyst in all of that was looking Out (to the mission). I was teaching a bible study to two kids, Lenny and Danny. One was a stoner and the other was a high school jock. They were brothers. All that prayer, God began to flow through that and my heart was for their salvation. The next six months were radical, that little bible study went from two kids to 70-80 kids. None of them were connected to our church. We were baptizing kids in bathtubs, burning satanic bibles, seeing exorcisms of demons and demon-possessed people. That all happened that junior year. By the end of that year, I was a completely different person. Jeff: I had no angels! Older PostWelcome to the new SF Lighthouse Website!